SRS scientist Susan Loeb recently studied little brown bats on the Chugach National Forest, Alaska. Photo by U.S. Forest Service. Bats do live in southcentral Alaska, that much is known. But the list of unknowns is longer. Which species live there? What habitats do they prefer? Where do they roost? What are their foraging habits? A recent U.S. Forest Service Southern Research Station (SRS) study begins to fill the information void about Alaskan bats. SRS scientist Susan Loeb, a research ecologist with the Upland Hardwood Ecology unit, traveled to the Chugach National Forest, Alaska to lead the study, which was recently published in the Northwestern Naturalist. Across the country, bats face multiple threats including disease, habitat loss, and global climate change. Many bats are expected to migrate northward in response to climate change, and understanding how they respond to environmental conditions at high latitudes is important for future conservation and management. Alaskan bats dwell at extremely high latitudes and face unusual challenges. 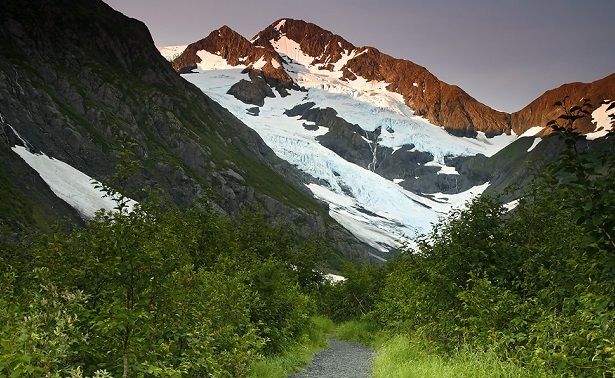 The Chugach National Forest receives more than 20 hours of sunlight per day at summer solstice, and just 6 hours at winter solstice. The enormous variations in day length could affect bats in a number of ways. “Because of the short nights, bats have less time to find food in the summer,” says Loeb. “This could affect reproduction, growth of young, and preparation for hibernation.” Longer days could also put bats at greater risk of being caught by predators. In more temperate regions like the Southeast, bat activity tends to be highest in openings and clearings, but in Alaska, denser forests may help bats hide from predators during the summer solstice. To gather information about the bats, Loeb and her colleagues used acoustic detectors to listen in on their echolocation calls. Researchers also used mist-netting to capture bats, measuring their weight, size, health, and other characteristics before releasing them. The 25 sites in the study area represented conifer, hardwood and mixed hardwood-softwood forests. In July, bats were active for approximately 5 hours each night, although they were less active on cold nights. In areas farther away from roads and human dwellings, bat activity began earlier in the evening and lasted longer. “Bats may have been avoiding the lights on and near roads,” says Loeb. “They may prefer more cover, especially in early evening.” Providing forest cover near roost sites could be an important management strategy for bats in northern latitudes. “Effective conservation and management of bats on the Chugach National Forest requires knowledge and understanding of bat ecology as well as their summer and winter habits,” says Loeb. Currently, researchers know very little about the winter habits of Alaskan bats. No one knows whether they hibernate in the study area or migrate elsewhere, and whether they cluster together while hibernating (potentially making them more susceptible to white-nose syndrome) or disperse into small groups. Read the full text of the article. Access the latest publications by SRS scientists.